Tooth decay is another name for the disease known as "caries," or cavities. A cavity is the result of your tooth enamel, dentin, or cementum being destroyed over long-term exposure to harmful bacteria. Many cavities are preventable Tooth decay is promoted by your teeth being frequently exposed to foods rich in carbohydrates (starches and sugars) like soda, candy, ice cream, milk, and cakes. Ironically, even fruits, vegetables, and juices can lead to tooth decay. When these foods break down in your mouth, they provide food for the bacterial film on your teeth and gums called plaque. The plaque interacts with deposits left on your teeth from sugary and starchy foods to produce acids. These acids break down tooth enamel over time by dissolving, or demineralizing, the mineral structure of your teeth. This leads to tooth decay and weakening the teeth. Plaque is a film of bacteria that forms on teeth and gums after eating foods that produce acids. These foods may include carbohydrates (starches and sugars), such as candy and cookies, and starchy foods, such as bread, crackers, and cereal. In addition to causing cavities, plaque can lead to gum irritation, soreness, and redness. 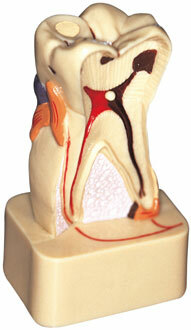 Sometimes, your gums may begin to bleed as a result of plaque accumulation. Long-term, plaque can lead to serious problems. Sometimes, the bacteria can form pockets of disease around tooth structures, eventually destroying the bone beneath the tooth. In regards to early childhood caries, avoid putting your baby or small child to sleep with a bottle containing anything but water, because juices and milk contain sugars that can be harmful to teeth. When a child sleeps, these liquids "pool" in the mouth and bathe the teeth. Early childhood caries may occur when sweetened liquids, such as milk, formula, and fruit juice, are given and are left to pool in an infant's mouth for long periods of time. Baby bottle tooth decay can lead to severe cavities in your child's mouth, and destroy the teeth if left untreated. Avoid allowing your child to fall asleep with a bottle and avoid breast feeding at will after the first baby tooth begins to erupt.